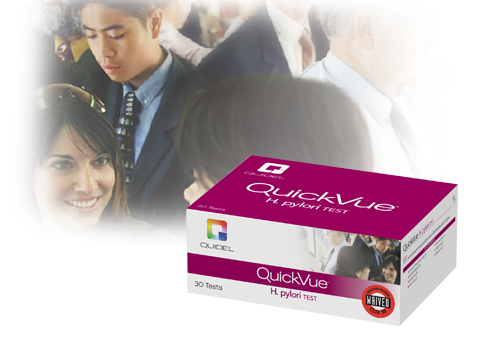 The QuickVue H. pylori Test detects IgG antibodies specific to Helicobacter pylori in human serum, plasma or whole blood. It utilizes a convenient, non-invasive, and easy to perform test methodology to aid in the diagnosis of H. pylori. The test is easy to perform in a one-step procedure using two hanging drops of whole blood. Serum and plasma can also be used. No refrigerator space needed. No need to wait for reagents to warm up. Rapid H. pylori tests can be run immediately as needed.